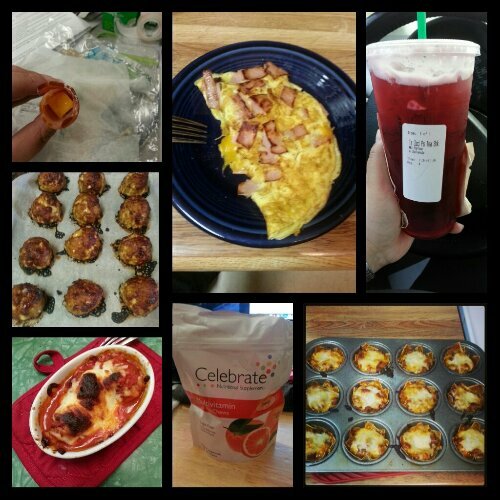 Today’s food choices, from upper right: unsweet passion tea from Starbucks (I ask for Splenda instead of the syrup that sweetens it); mini lasagna with steamed broccoli (not shown); multivitamin x2; meatballs in marinara with mozzarella; cheesy barbecue turkey meatloaf mini with broccoli and cheese (not shown); ham and cheese rollup; one egg omelet with ham and cheese. I have been run ragged this week, and it’s only Tuesday. Tonight was my second late night as we had Open House at school tonight so I was at work for 12+ hours today…tomorrow doesn’t look to be a short day either, and neither does Thursday. Interesting story: I did bond with a parent of one of my students tonight over the sleeve–she had one done a year ago with the same doctor. I will get some rest on Friday, I think. I hope. Saturday I have a workshop to attend, and Sunday I’ve agreed to tutor a former boss’ daughter in AP Bio. I really need to learn to say no, don’t I? Perhaps that’s a post for another time when I am not physically and mentally tired. Bedtime calls, so off I go. This entry was posted in daily bites, post-op, vsg, weight loss surgery and tagged daily bites, eating, fatigue, post-op eating, post-op life, VSG, vsg realness, WLS. Bookmark the permalink.